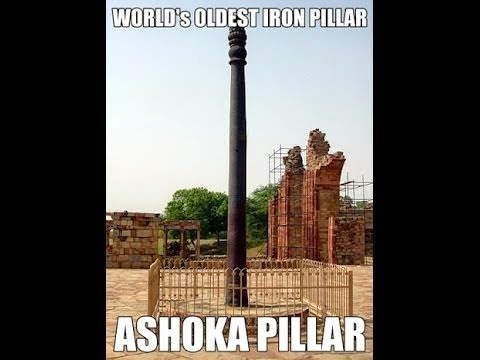 The Delhi iron pillar is testimony to the high level of skill achieved by ancient Indian iron smiths in the extraction and processing of iron. 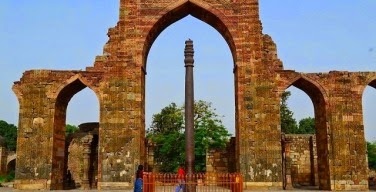 The iron pillar at Delhi has attracted the attention of archaeologists and corrosion technologists as it has withstood corrosion for the last 1600 years. The several theories which have been proposed to explain its superior corrosion resistance can be broadly classified into two categories: the environmental and the material theories. Proponents of the environmental theories state that the mild climate of Delhi is responsible for the corrosion resistance of the Delhi iron pillar. It is known that the relative humidity at Delhi does not exceed 70% for significant periods of time in the year, which therefore results in very mild corrosion of the pillar. On the other hand, several investigators have stressed the importance of the material of construction as the primary cause for the pillar's corrosion resistance. The ideas proposed in this regard are the relatively pure composition of the iron used, presence of Phosphorus (P) and absence of Sulphur/Magnesium in the iron, its slag-enveloped metal grain structure, and passivity enhancement in the presence of slag particles. Other theories to explain the corrosion resistance are also to be found in the literature like the mass metal effect, initial exposure to an alkaline and ammoniacal environment, residual stresses resulting from the surface finishing operation, freedom from sulphur contamination both in the metal and in the air, and surface coatings provided to the pillar after manufacture (barffing and slag coating) and during use (coating with clarified butter). That the material of construction may be the important factor in determining the corrosion resistance of ancient Indian iron is attested by the presence of ancient massive iron objects located in areas where the relative humidity is high for significant periods in the year (for example, the iron beams in the Surya temple at Konarak in coastal Orissa and the iron pillar at Mookambika temple at Kollur situated in the Kodachadri Hills on the western coast). It is, therefore, obvious that the ancient Indians, especially from the time of the Guptas (300-500 AD), produced iron that was capable of withstanding corrosion. This is primarily due to the high P content of the iron produced during these times. The addition of P was intentional as iron produced during earlier times does not show the presence of P.
To understand the precise reason for the corrosion resistance of the Delhi iron pillar, we analysed the composition of the rust on a Gupta period corrosion resistant iron clamp and also the rust on the Delhi iron pillar. Archaeometallurgical studies form a small component of our research activities. It is clear that referring to the Delhi iron pillar as rust-less is misleading as the iron pillar derives its corrosion resistance from the passive surface film (i.e. rust) that forms on the surface. We undertook a detailed rust analysis using modern sophisticated characterization techniques like Mössbauer spectroscopy and Fourier transform infrared spectroscopy (FTIR). We summarize below some of the exciting results of our study. The present study also provides valuable insight into the corrosion resistance of steels.